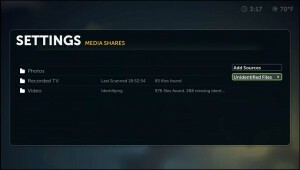 Easily see how many files Boxee is scanning, has identified, and doesn’t recognize within your media collection. Check the status from any menu sidebar (TV shows, Movies, Music) or from the Media settings menu (Settings -> Media). 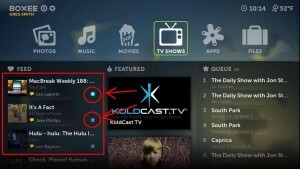 Help Boxee identify your personal media by telling it what’s in your collection. 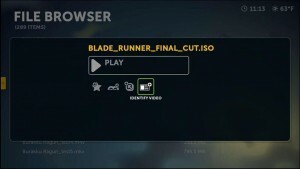 To change incorrectly labeled files select the movie or TV show, then click the “drivers license with a circle in the top right corner” icon on the right end of the pop-up menu. Find and identify unresolved files by going to the “Files” menu, and selecting the “unresolved” folder from the bottom of the list. Select the file, adjust the name and press Search. Then click on the correct movie, which in the case above is Blade Runner (1982). If the video is a television series, you’ll be able to enter in the episode number and season. In addition to pushing recommendations to your social networks, you can see recommendations from friends on Facebook & Twitter from within Boxee. Shared videos appear automatically in your feed with an icon on the right to let you know where they are from. The top one circled is from Twitter and the second one circled is from Facebook (click to enlarge). 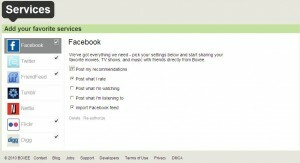 Set up this new option from the web in your service settings for Facebook & Twitter at: http://www.boxee.tv/services. Boxee created a brand new way to manage, discover and play RSS feeds in Boxee. The feed will first need to be added in from the new management & discovery console on Boxee’s website. 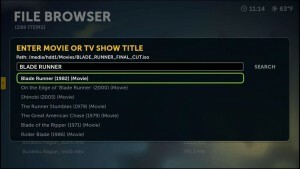 On there, you can search, arrange by category or sort through the most popular, top rated, new, and HD feeds available on Boxee. Then use the RSS feeds App to play back your favorites. The Management & Discovery console is available at: http://www.boxee.tv/feeds. Bug Fixes and Fixes and Fixes, and Fixes! Boxee also claims to have been able to address hundreds of bugs in this version of Boxee and I would tend to agree. Lots of things like Hulu that had previously had trouble in Linux is now working perfectly.